The Turkish Van: white with red patches on the face and rings on the tail. there are no other varieties except that the cat is sometimes "odd eyed" - each eye being a different colour. Occasionally in the white Van kedis, they can sometimes be deaf, but this is not always the case and they are usually blue eyed. The fur is fluffy and long and the tail is full. Generally the cat is not averse to wintry climates, but, like most breeds, prefers to be indoors. In order to avoid a nervous Van, one should handle it a lot from infancy on into adulthood. The Van is naturally found around her namesake, Lake Van in Turkey. Raised around the water, the breed has an affinity for wet stuff, and really likes to swim. An old breed, this cat has been a household pet for centuries. Her water prowess is well known in Turkey, where she's been known to swim into the harbour to greet fishing boats. Ancestors were given as gifts to the nobles of 16th-century France and England by Turkish sultans. Vans fell out of fashion by the late 19th century; Angora (Ankara) Zoo kept these cats as protected species, and domesticated breed were reestablished in the mid 1950's. In 1955 Laura Lushington and Sonia Halliday returned to England from a Turkish vacation with a couple of cats from the Lake Van area. Four years later, they brought home two more. The cats' white kittens with auburn markings launched the Turkish Van. It was registered in Britain in 1969 and in North America in 1985. According to myth Allah's Prophet "Muhammad", always waited on his cat Muezza (or Meuzza). And though Muhammed swept across Arabia with his drawn sword, he learned patience, they say, from a mother-teacher extraordinaire - Muezza. By cutting off his sleeve rather than disturbing his sleeping friend when the muezzin called for the prophet to prayer, he assured that all cats thereafter would be treated the same, as one would treat one's own mother. The city of Van is but a few miles from Mount Ararat and there are those who like to believe that when the Ark came to rest on the mountain top and the flood waters receded that the cats left the Ark and made their way down the mountain slopes into Van. Indeed the spot of auburn colour often seen on or near the left shoulder of the Van cat is said to be the spot where Allah accidentally touched the cats as he blessed all the animals as they were leaving the Ark. The origin of the Turkish Van is lost in antiquity but archaeological finds in Van province (formally part of Armenia) of relics possibly from an ancient battle during the occupation of Armenia by the Romans (AD 75-387), include battle standards and armour bearing images of a large pale self coloured cat showing distinctive rings on the cat's tail. Even more recently, during the excavation by the British Archaeological Institute in Ankara of a late Neolithic (7000 years ago) site near Hacilar, 22 small terracotta statues said to be women playing with cats were found on one level. Because of this discovery some scientists now question the long held belief that cats were first domesticated in Egypt. The Turkish Van is a loyal, loving and very intelligent cat. Its temperament depends greatly on its upbringing, the amount of human contact and handling it receives as a kitten, and the temperament of the mother herself. They are very affectionate, giving head butts and love bites, but to the uninitiated this could be slightly alarming, but when you get to know your cat you will begin to understand. They are great climbers, so don't be surprised to find them sitting on top of doors, kitchen units or wardrobes, and some wouldn't think twice about climbing your curtains and sitting on the curtain rail. A great game is retrieving screwed up paper, some catching the ball of paper in mid flight, others making great somersaults. Where water is concerned, some are not very keen at all, whereas others may love dripping taps, especially drinking from them, then flicking the water with their paws, or dropping toys into their water bowl. It has been known for Vans to swim in the bath, swimming pool or even the sea. So be warned they may come and join in your daily shower. They may also become curious about toilets, so do NOT leave the lid up! They like to be involved in everything their owners do and follow them around like a dog. In fact some people have said that Turkish Vans are more like dogs than cats. On the whole, they get on very well with dogs indeed, but the Van will want to be the boss. In most instances the females are more independent and if you have a male and female, she will normally rule the roost, but there are always the exceptions. Of course, as with all things in life there are a few downsides. Vans have been known to wreak havoc, such as shredding curtains, knocking ornaments and plants off shelves, mantelpieces and kitchen surfaces etc., sometimes this is quite deliberate! Also they have the ability to open doors, especially cupboards etc. and don't think twice about knocking the contents onto the floor. It appears to most owners that the Turkish Vans can be sensitive to certain sounds, and some are so sensitive that they appear to be nervous and will run and hide. On a cautionary note, don't catch a Turk unawares from behind, if startled they have been known to bite. Travelling is another story. Some are very well behaved, others can be extremely vocal, sick or even mess themselves! There are various treatments available but they are not always as successful as we would like. There have been many Turkish Vans that have been lead trained and enjoy their walks with their human owners, perhaps through country woods. They may even enjoy a paddle in a stream. The beach is another place of enjoyment, but beware of the strong winds, some Turks are very wary of them. Do not be surprised if one day you find that your Turkish Van has adopted a wild animal or young bird that has lost it's mother - most have the Mother instinct, but there are exceptions. 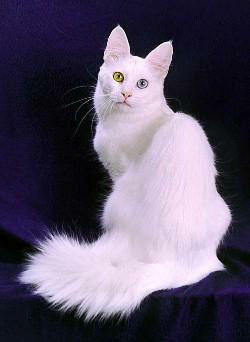 The Turkish Van has since June 2000 achieved GCCF Championship Status in the UK with new colours of the Breed. They are now available in Auburn, Cream, Black, Blue, Tortoiseshell, Blue Tortie, Brown Tabby, Tortie Tabby and Blue Tortie Tabby markings and tail, with either Amber, Amber/Blue or Blue eyes. Thanks go to "Melva" from www.turkishvancatclub.co.uk for that extra information.